Whether you are constructing a house from scratch or doing renovations, the type of windows to use is a topic that will always come up. There are several types of windows, but the two major ones include the single hung and the double hung type. In determining the type of windows to use the factors to consider are the condition of the current window frames, the specialty features needed, the style of window preferred and the number of windows required. In addition to this, home owners should also consider the ease of cleaning and maintenance and the overall cost of purchase. Single-hung windows have one openable panel while the double-hung have two panels that can be opened and tilted inwards. What is a Single-Hung Window? Single-hung windows are more commonly used and are the standard type that are used in commercial buildings, apartment and offices. 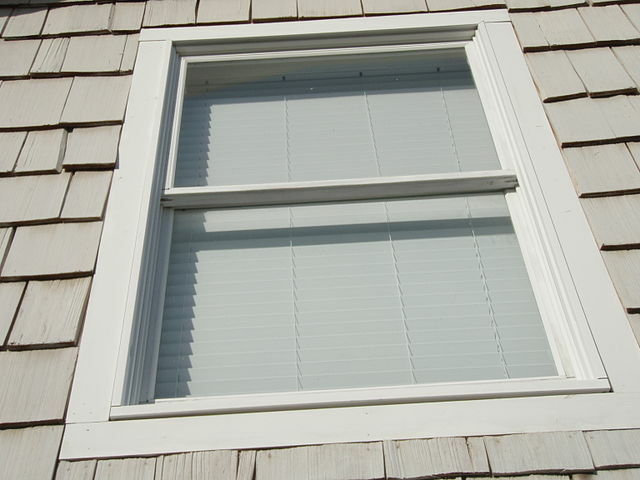 The bottom panel of single-hung windows can be moved vertically, as the upper panel remains stationary. When this type of window is open, the lower panel obstructs the upper panel partially. These type of windows are popular for one reason, cost. 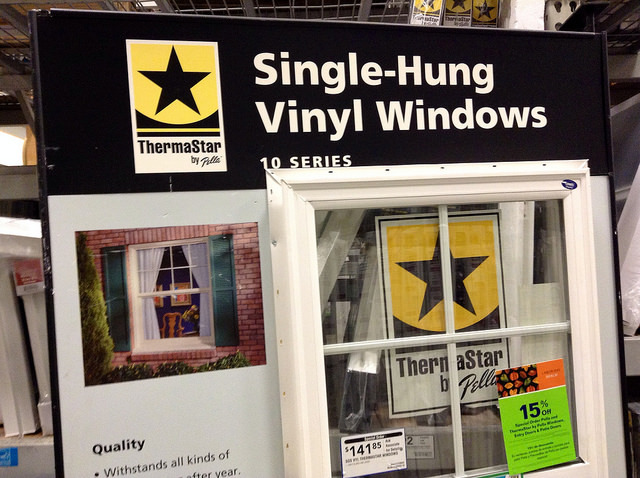 The windows are way cheaper than the double-hung and are also easily accessible, since many hardware stores stock them. This may however, only be significant to the individuals who are replacing or putting up several windows at ago. The windows as much as they may be cost-effective, they have several limitations. One of them is that the window only offers a limited amount of ventilation. They may not be convenient for rooms that require a lot of ventilation such as bathrooms, as using them there can result in higher moisture levels, low relief of humidity, and low control of odor. Single-hung windows are harder to clean, especially for apartments and homes with windows that ae far off the ground. They may require such home owners to regularly hire window cleaning agencies. A double hung window is the opposite of the single-hung type. These windows enable the user to open both panels at a go, rather than just the lower one. They have two panels; an upper and a lower one, each can be opened and locked at a time or simultaneously. It gives better provision for ventilation and air flow within the room. Since, both stashes can be opened, the cleaning process becomes much easier. Homeowners with houses that are way above ground level can easily clean both panels without the need of special equipment or expertise. These windows are however pricier and can be around 10 to 20% more than the single-hung windows. The Price of single hung windows is much cheaper than that of double-hung ones. The double hung can cost up to 20% more than the single ones. This analysis is however on the purchase cost only. The maintenance costs are different for the two window types. The single-hung windows may require use of special equipment of hiring of specialized companies to clean or fix them. The double-hung windows are cheaper to maintain due to the cleaning aspect. It is hard to clean the single-hung windows as the exterior of the top panel doesn’t tilt inwards. This is however hard to clean only for individuals living on floors above ground level. The double-hung windows are easy to clean regardless of the window location. Both panels can tilt inwards making it easy to clean. The top panel of single-hung windows does not open or move. The bottom one is the one that can be tilted inwards. Both the sashes of a double-hung window can be opened, tilted and locked. The ventilation from single-hung windows is minimal as only one part opens up. The ventilation of double-hung windows is much more. The single-hung windows are suitable for rooms on the ground floor. They are also suitable for rooms that don’t require much ventilation such as living rooms. The double-hung windows are great for all windows regardless of position from the ground, they also work best for rooms with high ventilation needs such as bathrooms and kitchens. The single-hung windows are more common than the double-hung windows. Reports indicate that of the total number of single-hung and double-hung windows, 60% of them are single-hung. The single-hung window is that which has only one openable panel. The upper one remains stationary. Double-hung windows have panels that can be opened simultaneously. It is easy to clean the double-hung windows as both panels can tilt in. The single-hung panels may require special equipment or hiring cleaning expertise. The ventilation are in single-hung panels is much less than that of double-hung panels. Double-hung panels can be used in any room type. Single-hung panels are suitable for rooms on ground floor and those with minimum ventilation requirements. In terms of preference, people prefer the single-hung windows, of all double-hung and single-hung windows, 60% are the single-hung type. Evah Kungu. "Difference Between Double Hung and Single Hung Windows." DifferenceBetween.net. 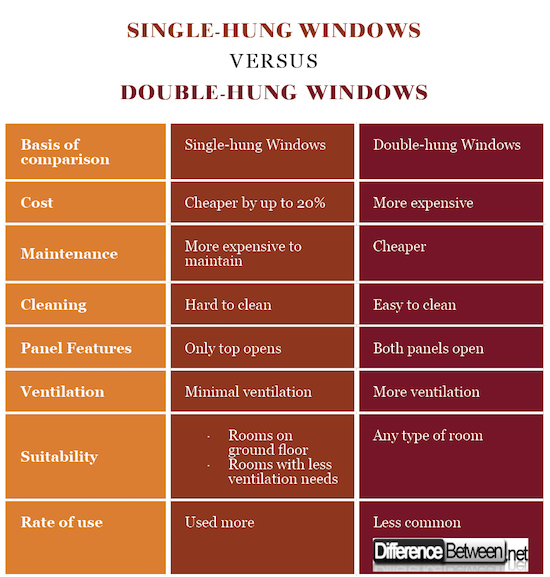 May 15, 2018 < http://www.differencebetween.net/object/difference-between-double-hung-and-single-hung-windows/ >. Meany, T. (2008). Working Windows: A Guide to the Repair and Restoration of Wood Windows. Rowman & Littlefield. Facilities Engineering, Maintenance and Repair of Architectural and Structural Elements of Buildings and Structures. (1990). Departments of the Army, the Navy, and the Air Force. Schuler, S. (1978). The homeowner’s directory: a complete guide to the best equipment available for building, remodeling, and repairing your home. Simon and Schuster.